Trumpeter Bob Everhart was born in Columbus on May 31, 1945 to a musical family. Bob’s father, Dr. Robert Everhart, had a 35-piece big band called the Doc Everhart Big Band for over 50 years. The Doc Everhart Big Band held dances twice a year at Valley Dale and the Aladdin Shrine Mosque and the members of the band would invite their family and friends — these fun events attracted as many as 2,500 people. This experience undoubtedly furthered Bob’s love of music. At age three, Bob’s dad got him started on the drums and at age eight began piano lessons. At age ten Bob found his true musical love, the trumpet. He took trumpet lessons from one of his father’s closest friends, Ziggy Coyle. When Bob was in the 9th grade, he joined his father’s band. Bob graduated from Linden-McKinley High School in 1963 and attended The Ohio State University, majoring in business, performing in the Ohio State University Marching Band and the Ohio State University Jazz Band. In 1966, he left OSU to go on the road with the Americana Brass show band, a take-off of the popular Tijuana Brass band. For six years, Bob traveled with the band across the United States, Mexico, Canada, the British West Indies, Germany, and Switzerland. In 1972, he left the group to tour with the Holiday on Ice Show for two years as lead trumpet. Bob left traveling on the road in 1974, settling down in Columbus. He continued playing the trumpet, performing with many local bands. During this time, he also played with Les Elgart, Buddy Morrow, and the Jimmy Dorsey Orchestra. In 1975, proving that music and math truly go hand-in-hand, Bob went to work for the Franklin County Auditor’s office for the next 18 years. In 1993, after leaving the Franklin County Auditor’s office, Bob began working for the State of Ohio Department of Taxation, where he is currently employed. 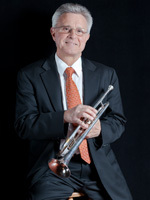 When not performing with the CJO, working his day job, and running his two youngest girls to dance lessons, national dance competitions, basketball practices, basketball games, and numerous church events, Bob finds the time and enjoys playing lead trumpet with Street Players, one of Columbus’ most sought after party bands.